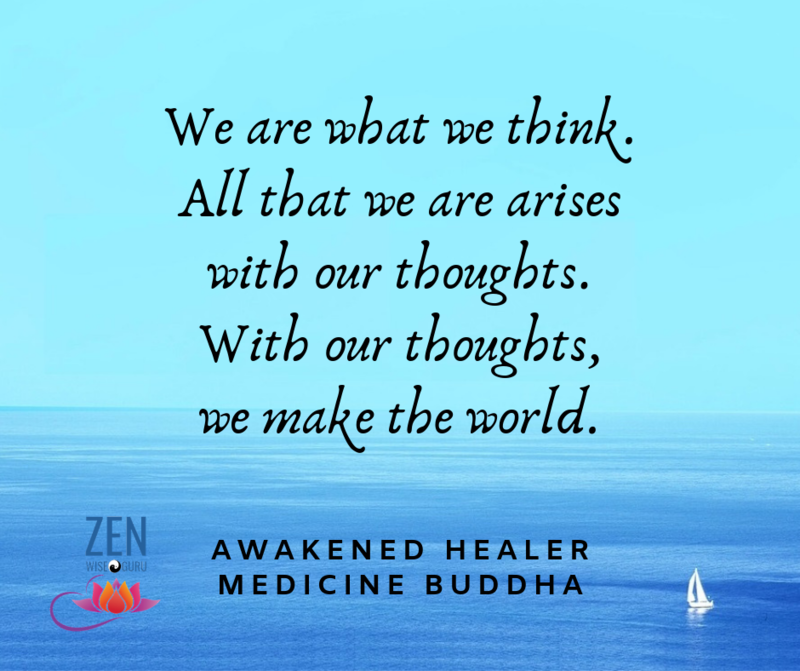 There is a Medicine Buddha in you. You are the healer extraordinaire. Awaken yourself. Learn the healing meditation of the Great Healing Buddha. You will receive Abhisheka empowerment, 3-Mystery Guided Meditation and practical healing applications of this amazing practice. I'm doing well with my health in great part because of dedicated practice of Medicine Buddha. Still doing Medicine Buddha everyday. Half my day is practice and it is the brightest part of the day. You're held in such high esteem and your students are quite fortunate indeed to have crossed your path as am I. Cutting bananas a week ago you crossed my mind and thought of the great laughter we had back in the day when we went for cut that tree. That always brings a smile to my heart when I remember that day in Wailuku. I sincerely wish I could lei bananas on you regularly and some more of those chocolate covered macadamia nuts too. What ZenWise Guru is telling you is true. Do your practice with a strong mind and you'll see how your health improves and with a foundation of Medicine Buddha how you can help others. ​Larry has had rheumatoid arthritis for decades. He moved to Maui Hawaii to live out the rest of his life after all his joints had been eaten away by his health condition. He said, "I want to die in a beautiful place." He was expected to die in a few months almost two decades ago. He had outlived the expectation of his doctors, the insurance company, his friends and family. He has dedicated himself to the practice of Medicine Buddha. May he live long and prosper. I experienced a very welcome and unexpected health improvement during a healing training session. I learnt about the visit of a healer during a Tai Chi class. I went to see what this was all about with great scepticism and did not think that this type of thing was ever possible. The introduction and first healing session were so amazing I decided to continue. During one of the sessions with ZenWise Guru, we were practising healing. I was sitting in a chair with another student in front of me and he was behind me demonstrating. He said to me don't move so I just sat there. After a discussion, I got up from the chair and felt very different. I could move my neck without obstruction. The lump on it was gone! It was missing! I had lived with a lump on the left back side of my neck at the base of the skull for many years. It was the size of a large marble, sometimes caused a lot of pain and affected my neck movement but I was too scared to go see a doctor about it. I dealt with it as one would deal with a sprained ankle. Nothing serious, it would just be a constant weakness and irritation. I never told anyone about it, because I was afraid of what it might be. I did not mention it to ZenWise until later, so when it was gone, I couldn't believe it. I still can't believe it. I am very thankful for this healing. I learnt the Medicine Buddha teaching in 2003 and started practising it daily in 2004. ​In 2009 I was in a car accident where I was rear-ended. I did not go to the emergency room (no insurance), but afterwards a medical intuitive said there was something wrong with my lower back. Via the good graces of a lawyer and then a chiropractor, I was able to get an MRI done, where indeed they found something. An ultrasound was scheduled for 3 days later. I missed that appointment however because of bad traffic in Los Angeles and had to reschedule for the next available time - 3 weeks out. I spent the next three weeks practising Medicine Buddha every day and continued with my regular work schedule. ​Three weeks later I had that ultrasound. It lasted forever... so much so that they took a break. During the second time around, I asked why it was taking so long. They said that they were trying to locate the two large spots that were on the MRI. They were unable to do so, as they were no longer there. "I have experienced deep relaxation when receiving healing before, but I would never have imagined I could reach such a state of inner peace by myself through meditation. Medicine Buddha has become my go-to practice for self-care when I need replenishing." "My health and wellbeing have improved but for me, the emotional and mental clarity that I have gained since I started Medicine Buddha has in many ways rescued me in very stressful situations. I am sure everyone's experiences in meditation are different but for me, Medicine Buddha practice was truly my first experience of being able to 'let go'." How would you feel knowing you can make this happen for yourself forever more? If you are stressed, run down, suffering from anxiety, depression or poor health, or simply want to improve your life this class can benefit you. This one-day healing meditation workshop provides you with time-tested tools to begin to strengthen your physical and emotional wellbeing from now into the future. Perfected in ancient times to allow you to bring yourself and others back towards the blueprint of universal wholeness and understanding and so heal your suffering. Exclusive teachings, given only to Living Buddhas since time immemorial is now open to any seeker due to the needs of our time. Taught by the Master who translated this classic practice of the Bodhi Path into English. Connects you to the lineage of Enlightened Masters who have passed on this wonderful teaching for millennia. Opens up your Central Meridian to set the foundation for your spiritual evolution. Allows you to reach a level of proficiency which otherwise could take decades to develop. Medicine Buddha is traditionally regarded as the Archetypal Healer. Having attained the wisdom of enlightenment he saw through the illusion of separateness and how it is a major cause of suffering in our world. Like a fog, this illusion prevents you from seeing your true nature and the reality of the world you are living in. Through regular Medicine Buddha meditation practice, the fog begins to dissipate and with it the stress which creates and fuels so much mental, emotional and physical suffering. Transcend Into Oneness or as Shamans say - Become One With All of Creation - that space where spiritual healing can take place. We are all one... In healing yourself you are healing the whole of creation. 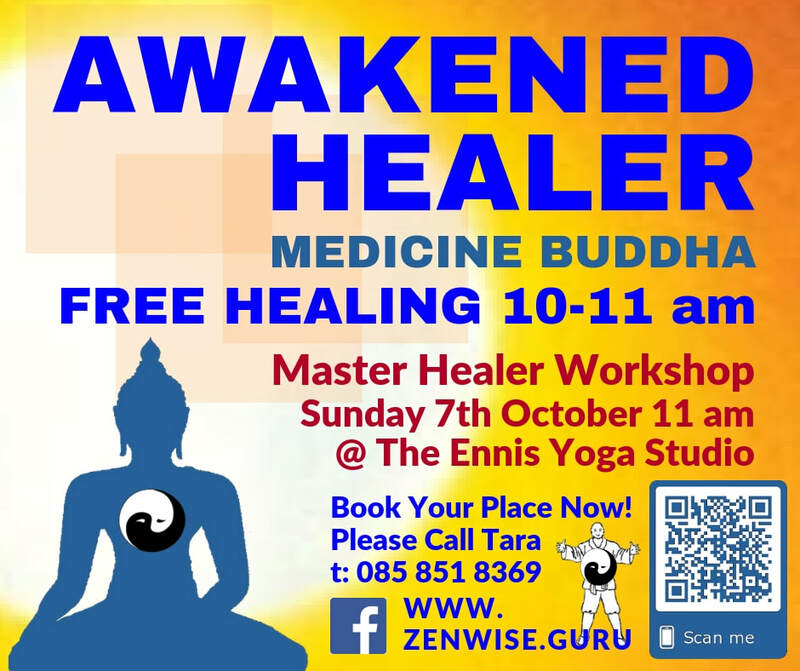 All Are Welcome to receive Free Healing 10-11 am Sunday 7th October @ The Ennis Yoga Studio. Seek initiation with this teacher of Vismdo Buddhist College, located at the Vismdo Monastery in the Qinghai-Tibetan plateau. The college was established by the 10th Panchen Erdeni, a tulku of the Gelug School of Tibetan Buddhism. The headmaster is the 26th Garwa Rinpoche of the Sakya School. No need to walk to the Himalayas. Destiny has brought this very ancient hidden lineage of the Great Healer Medicine Buddha to Ireland. Larry can do it. You can do it. Call now!